As with the previous two issues, I was thrilled when Issue No. 3 of Mortise & Tenon Magazine recently arrived in my mailbox. 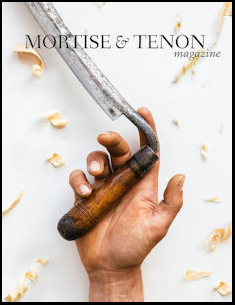 In part, my delight was due to the intriguing photo of a handheld drawknife on the cover. But even more, it was from anticipating the 10 articles that lay within. Enhanced by a wealth of beautiful photography and drawings and delightfully laid out, the issue promised a feast for the eyes as well as for the mind. It did not disappoint.